The Indians lay another 7 on the Red Sox, take a commanding lead in the ALCS and threaten Fox with a flyover World Series. The Cleveland Indians have perfected the art of the seven-run inning, turning in their second in three games Tuesday night on the way to a 7-3 win over the Boston Red Sox and a three games to one lead in the American League Championship Series. For their next trick, they'll take the day off, the signature move of the 2007 postseason. The series steps aside Wednesday for ... for who knows what, and resumes with Game 5 Thursday, also in Cleveland, expected showers and thunderstorms be damned because even with copious open dates built into the schedule, Major League Baseball is happy to play its most important games in rainstorms. The National League champion Colorado Rockies spent Tuesday laying in supplies for the longest layoff in baseball history. Several players announced plans to develop and build a hotel and retail complex in Denver that's expected to be open for business by the first pitch of the World Series. Boston starter Tim Wakefield dazzled and confused the Indians with his knuckleball in the early going Tuesday, giving up nary a hit before Jhonny Peralta pounded one off the left field fence for an ironic foreshadow of a double with two outs in the fourth. Wakefield struck out seven and walked two in those four innings of one-hit shutout ball, and in retrospect he should have called it a night. Not that handing the baseball to their bullpen has been doing the Red Sox a lot of good in this series. In the fifth, the Indians said, "Ah, we get it now," and, with the help of a little luck, piled up the seven runs that took them to the brink of their first World Series appearance in 10 years, their second in 12 and their third in 53. Casey Blake led off with a homer, Franklin Gutierrez singled, Wakefield hit Kelly Shoppach with a pitch, and then, after Grady Sizemore hit into a fielders choice to leave runners at the corners, Asdrubal Cabrera hit a pop foul behind first that Kevin Youkilis caught, bobbled, bounced off of second baseman Dustin Pedroia and finally dropped. Gutierrez had tagged and would have scored had Youkilis held onto the ball, but it also would have been two outs. Cabrera then hit a bouncer up the middle that Wakefield got a glove on, preventing Pedroia from making a likely play. The infield single made it 2-0. Twice over now, Travis Hafner's strikeout might have been the third out. Instead it was the second, and Victor Martinez's single made it 3-0 and chased Wakefield. Manny Delcarmen came in and promptly gave up a three-run homer to Peralta and it was 6-0. The Indians added another run on Kenny Lofton's single and steal and then an RBI hit by Blake. The Red Sox got rid of Cleveland starter Paul Byrd in their half of the sixth on back-to-back home runs by Youkilis and David Ortiz. 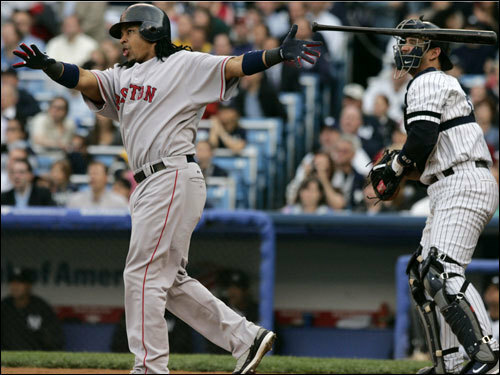 Manny Ramirez greeted reliever Jensen Lewis with a rocket of a homer to right-center, which he admired, with that Pavarotti pose he's been striking this year, as though the Red Sox were leading by four, not trailing. That's Manny being Manny, of course, and this column is a big fan of Manny's whether he's being Manny or being Ethel Merman, as it's reported he likes to be at parties. But even when Manny's being -- well, you know -- doesn't Manny look at the scoreboard? Maybe he thought those balls hadn't clanked off of his teammates' gloves in the previous inning and his homer had put the Sox up 3-2. 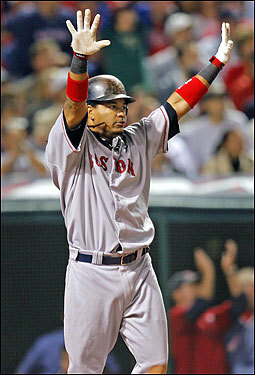 Lewis settled down from there and the Sox never again threatened against him or Rafael Betancourt. The Indians are one win away from a flyover World Series that will have Fox TV executives diving for the Maalox. Cleveland vs. Colorado, in a postseason that had started out with the possibility of a Red Sox-Chicago Cubs Series and the 20th century ratings such a matchup promised. Wakefield became the third consecutive Red Sox starter to get KO'd after precisely four and two-thirds innings. Wakefield, Curt Schilling and Daisuke Matsuzaka have combined to give up 14 runs and 20 hits in their 13 and a third innings, which isn't exactly getting the Sox off to a good start. That said, only three of the 14 runs that have scored in those two decisive seven-run frames came against a starter. The Red Sox bullpen has a gasoline-fueled ERA of 6.19 in this series. Starting pitching has to be pretty damn good to create a hedge against that. The Red Sox will send the one starting pitcher who's been pretty damn good in this series in Game 5, Josh Beckett, who has been bothered by a stiff back, Fox's Ken Rosenthal reports. In Game 1 Beckett threw six strong innings, the bullpen backed him up with three more and the bats unloaded for 10 runs against Cleveland ace C.C. Sabathia and reliever Lewis. That's a formula for a pennant, and the Red Sox haven't sniffed it since. Those three elements have yet to come together again in the same game. The Sox did score six in Game 2 against vice-ace Fausto Carmona, but they gave up that seven-run 11th for that most depressing of outcomes, a lopsided extra-inning defeat, and they've only managed five runs in the two games since against the back of Cleveland's rotation. The Red Sox have come back from a 3-0 deficit to win a series in living memory -- you may have heard about this -- and history says it's a lot easier to come back from 3-1 than from 3-0. History also says it's a lot better to be the team with three wins. You can't get this kind of analysis just anywhere. The good news for the Sox is that Beckett, who's building a résumé as one of the greatest October pitchers of all time, gives them a good shot at getting the series back to Fenway Park, where they played .630 ball this year. By Game 6, if there is such a thing, Wakefield, who won't be needed to start again, should be available as a reliever. That would both obviate the need for manager Terry Francona to reach for the reeling Eric Gagne and allow him to have a quicker hook on Schilling, who had been pitching well before Game 2, and the laboring, exhausted Matsuzaka, who is leaking oil and making disturbing grinding noises when he moves. Far better for Boston's fortunes would be Ramirez and David Ortiz leading the way to three straight 10-run games, with many home runs admired, arms outstretched. The Indians would be happy to watch Manny admire all the homers he wants as long as he does it the way he did it Tuesday -- from four runs behind.